We work closely with the local pre-schools to assist our teachers in identifying an accurate baseline and ensuring a smooth transition for all pupils starting school in Reception. Based on the Development Matters framework, pupils are assessed as 'developing', 'emerging' or 'secure' in the 30-50 month; 40-60 month and Early Learning Goals as they progress through the year. From September 2015, a baseline assessment has been introduced for all Reception pupils. The Early Years curriculum is broken down into seven distinct areas. Playing and Exploring - Finding out and exploring, Playing with what they know, Being willing to have a go. Active Learning - Being involved and concentrating, Keeping trying, Enjoying achieving what they set out to do. Creating and Thinking Critically - Having their own ideas, Making links, Choosing ways to do things. 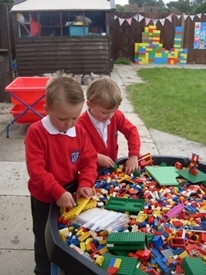 At the end of the year, progress and attainment will be reported to parents in an Early Years Foundation Stage report.